We are a group of people who are passionate about Freestyle Dressage to Music. We have developed this site to share with you our passion and to enable others to join in and take up the sport or just enjoy knowing a little more about what goes into it. The freestyledressage team is made up of registered instructors and experienced riders and competitors! We discovered the fun of dressage to music training and competitions at our Riding Club in 2005. Since then we have worked hard to make freestyle dressage accessible to all riders whether their goal is to compete at Pony Club, Riding Club or BD competitions or whether they want to add a new dimension to their schooling. For the past 20 years John has run an Information Technology Services company based in the UK, employing some 250 people in offices around the world. 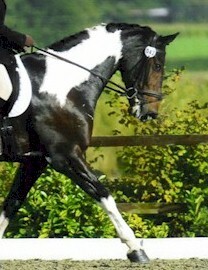 Prior to moving into the field of computers John trained for his BHSAI after which he spent a number of years competing on the eventing cirucuit. He went on to pass his BHSII whilst working as stable manager at the Windmill Hill Riding Academy in Stratford upon Avon. John has competed in 1, 2 and 3 day events and was 2nd at the Windsor 3 day event. He and wife Joanna, an ex mounted police officer, compete on their horse Rio and they have a daughter, Hannah, who also rides. John brings his extensive expertise in the computer field into the freestyle arena by using software to help identify and edit music to fit freestyle tests and put it all together including using video.